Ever wondered who dresses the rich and famous in fur? 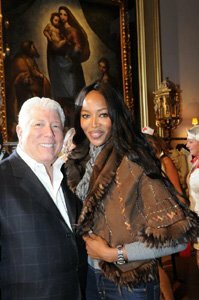 The answer is Dennis Basso, creator of sumptuous high fashion items for celebrities and socialites the world over. Still quite new in Europe, the name Dennis Basso is especially synonymous with style, quality and opulent indulgence in the US, where he has been a leading high fashion designer for over 25 years. The fact is, few other designers enjoy such cult status with their clients, and in the case of this brand they range from actresses and socialites to royalty and business leaders. When it comes to fur it simply doesn’t get any better than this. Using the finest and rarest quality Russian Sable and Broadtail, US Mink, Chinchilla, these pieces are handcrafted to meticulous levels of detail and workmanship. The true genius, however, lies in the way Basso manages to create fashion items that reflect the most current fashion trends and sometimes makes you forget the medium he works with. His latest collaboration with Naomi Campbell, who is also the face of his ad campaign, resulted in The Naomi Campbell Coat, a unique combination of the ultimate Russian Barguzine Sable and Python. His design skill and ability to manipulate this noble material form the basis of collections that are timeless yet very much en vogue. The result is a client list that reads as the envy of the fashion industry, with the likes of Brooke Shields, Sharon Stone, Ivana Trump, Elizabeth Taylor, Hillary Clinton, Naomi Campbell, Melania Trump and Janet Jackson among the many famous aficionados. The brand also enjoys great recognition in the movie industry, with its pieces featuring regularly in films like Meryl Streep’s The Devil Wears Prada, on stage, where Catherine Zeta Jones and Renee Zellweger wear his creations in Chicago, as well as in music videos of Jennifer Lopez. It is also rumoured that Nicole Kidman will be wearing the award-winning designer’s creations in her new movie to be released next year. This entry was posted on Wednesday, August 18th, 2010 at 11:55 am	and is filed under Design. You can follow any responses to this entry through the RSS 2.0 feed. Both comments and pings are currently closed.